Our wide variety of Chemicals will keep your fleets on the road more and in your shops less. It's important to us that your fleets are operating at their greatest potential, and our chemicals are formulated to provide highly effective preventive maintenance and repair. At Wurth USA, we take the safety of your employees and their work environment into account while formulating our chemicals. 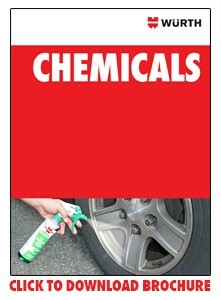 To see our complete line of Chemicals visit our online catalog. Wurth USA is dedicated to creating and distributing quality products that meet the highest standards of craftsmanship, longevity, and environmental responsibility. To that end, Würth has created the WURTH Green Line™, a complete line of environmentally responsible products for the transportation maintenance and repair industries. Chemical products are a necessary staple of the transportation maintenance and repair industry. Until now, many of these products have been exceptionally corrosive, harmful to the environment, and harmful to the professionals who use them. Würth is working to fight this predicament with a complete line of environmentally responsible chemical products that are less harmful and yet just as effective. Würth USA’s REFILLOmat® system is a revolutionary dispensing system that saves you money and reduces waste. The REFILLOmat® system minimizes can garbage and waste, thus reducing negative environmental effects. Our broad line of high quality lubricants covers all your needs. 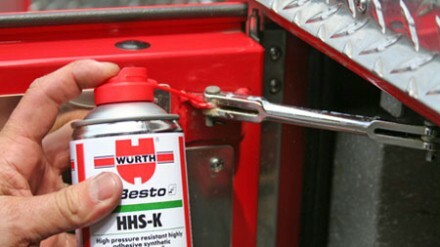 From HHS-K, our highly adhesive, penetrating lubricant, to Rost Off, our top quality penetrant that can loosen the toughest bolt, to CU 800, a superior anti-seize product, Würth has a lubricant to get your job done and tend to your fleet’s every need.